A senior traffic police officer in Cork City advised against measures which are central to national and local government policy on sustainable travel and cycling, documents released under the Freedom of Information Act show. In a submission on phase 2 of the Cork Cycle Network by Sgt John O’Sullivan the phrase “This is a Dangerous proposal” is repeated over and over. The plans — since largely implemented — include contra-flow and other cycle tracks on mainly city centre streets. 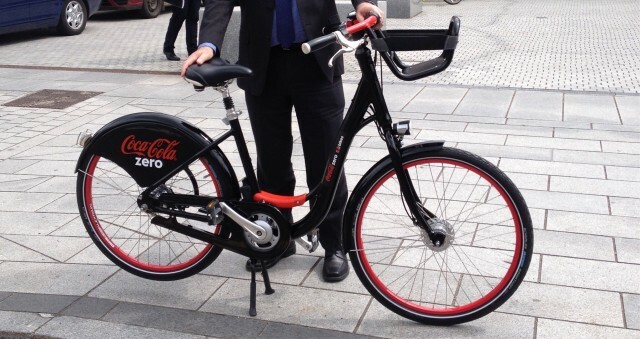 The cycle network will provide routes for users of the Coke-Zero Bikeshare.ie scheme which is due to launch in the city later today. Docking stations are dotted in and around the cycle routes which a letter from the Gardai objected to. Phase 2 of the city’s cycle network focuses on three routes between University College Cork and the city centre, the plans were developed using Section 38 of the Roads Traffic Act 1995 which require consultation with the Gardai. The letter is not dated, although it is stamped by the Cork City Council traffic section as being received on “05 Oct 2012”. The letter, which is signed by Sgt O’Sullivan (and readable in full below), outlines a fundamental issues with contra flow cycle lanes or paths. Such cycle paths and lanes, however, have been proven to work in Dublin and across Europe, including in low to mid level cycling cities such as Paris, London, Berlin, and many others. With little variance, Sgt O’Sullivan, repeats the phrase: “This is a Dangerous proposal. It places contra flow cycle lanes on the street travelling against the flow of traffic and reduces the capacity of the city to flush out traffic in the event of an emergency and also severely hinders the passage of the Emergency Services across the city.” This is mentioned in reference to plans on Western Road, Lancaster Quay, Washington Street, South Main Street, and Bishops Street, Frenches Quay, and Sullivans Quay. In a number of the cases he said that bicycle users could use the “existing bus lane” to access the city centre from the west. The National Cycle Policy, which is Government policy, says that it is a goal to: “Ensure that the urban road infrastructure (with the exception of motorways) is designed / retrofitted so as to be cyclist-friendly and that traffic management measures are also cyclist friendly.” One of the main measures to achieve this is listed as: “contra-flow cycle lanes on one-way streets / making two-way streets for cyclists”. The NTA and the city council also reference the National Cycle Manual which includes examples of contra-flow cycle paths and lanes. The letter — and another by a more senior officer the year earlier — shows a strong focus on keeping motor traffic moving over providing for cycling. His concerns were first publicly outlined at a meeting if the city council’s roads and transportation committee held in February 2013. However, the minutes only show toned-down outline of Sgt O’Sullivan’s views. Supporting documents also released under FOI show how Cork City Council and the NTA link the Cork Cycling Network projects to national and local policy. For at least part of the project a Road Safety Audit was undertaken at planning stage, as well as after the project was completed — our understanding is that the audits are usually only undertaken after the completion of projects. The minutes of the transport committee meeting outline how the Road Safety Audit and other advice was taken onboard to improve the project. Measures taken to change the designs included improved signage and optimising segregation. The council also said that the cycle routes are compatible with the City Centre Traffic Management Plan and that the same consultants are working on both projects. A request for clarification on the position of the Gardai was requested last year. It was confirmed that this was forwarded to the relevant section for reply but no reply has since been forthcoming. In this much shorter letter (also readable in full in the links below), he said he would be “anxious” to discuss the impact on traffic disruption and potential for cause of collisions”. It also mentions that the force is “anxious” that on-street parking is maintained. Cork City Council at first rejected a request for the 2012 letter to be made available under wide-ranging Access to Information for the Environment regulation. The city council said that the regulations do not apply, but no reason was given why this was the case. By phone a city council official claimed that the regulations could not apply to road construction or redesign because such an interpretation would mean the regulations cover most types of council work. Even after repeated contact by phone and email, the council refused to give reasoning in writing. The High Court has since ruled, in another case, that copying the exemptions listed in FOI act does not amount of giving reasoning. Cian – as a minimum RSAs should be carried out at Stage 1 (pre-planning stage and called Stage 1/2 if no Stage 2 audit will be done) and Stage 3 (just prior to opening to the public). For schemes where road safety is a key aspect of the design, it is good practice to carry out a Stage F (feasibility stage), Stage 2 (pre-tender) and Stage 4 (couple of months after opening). With regard to the particular objections made by this Garda, on the surface it does all appear a bit strange: is the parking being eliminated near to a Garda station perhaps?! Also the individual in question is probably not too well informed on developments in good streetscape design practices and the shift away from streets as vehicle conduits and more towards liveable streets. More evidence about a police force that just doesn’t understand the real safety needs of cycling and how it is required to address the actions it was supposed to undertake in the NCPF (2009). An Garda regards cyclists as nothing more than ‘traffic vermin’. There is ‘institutional blindness’ to the real safety needs of cyclists – and handing our hi-vis vests is not the answer. How about tackling ‘dangerous overtaking’ of cyclists by rogue drivers? As Tristan says the real issue is that very few independent road safety audits are being conducted on traffic schemes. We need a paradigm-shift in how traffic is managed. Stop concentrating on ‘free-flow’ for motorised drivers. Training required at all levels. I imagine that the Gardai had no call to object to the removal of parking, unless they could claim that this was going to be a safety concern. The areas affected were nowhere near Garda stations. It would seem that any concerns about parking were made in the Gardai’s personal capacities, and not in their professional ones. Thanks for bringing this out into the public. Good on you for persistent and useful research, Cian! @Damien — I have not been down to Cork to see them myself and I know from what I’ve seen that the quality varies. The main issue highlighted above is the fundamental arguments against all contra flow and heavy focus on motor traffic flow and parking at all costs over providing for cycling. While it’s best to have a buffer between the car parking and the cycle path, the argument of having the cycle path between the car parking and the footpath is a standard one in Denmark, the Netherlands and cycling-friendly cities. I’m sure however it is a design which will take getting used to. If you have images I’m also more than happy to highlight things like 3 inch wide cycle lanes in the Irish Cycle Facility of the Week spot.